Investing is not as easy as it seems. "Buy low, sell high" sounds like simple advice, but most people have trouble maintaining the discipline and resolve to follow it on a consistent basis. With a singular strategic vision and cutting-edge analytic tools, The Post Oak Capital Group financial professionals serving the Sugar Land area empower you to follow this advice with the ultimate aim of potentially reducing risk while addressing your investment goals. 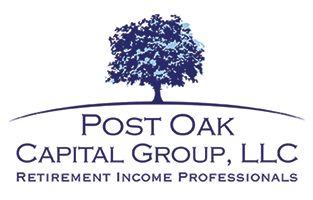 Post Oak Capital Group employs sound, time-tested investment management strategies that address your risk tolerance, time horizon and personal financial goals. Our goal is to craft an investment strategy that takes into effect various economic environments. Portfolio diversification is a cornerstone of sound investment management. A diversified portfolio holds a mix of asset classes and provides exposure to a broad range of economic sectors. Truly diversified portfolios typically contain cash or cash equivalents, equities, mutual funds, corporate and municipal bonds, tax-deferred investment vehicles and real estate. It is important to note, however, that there is no such thing as an "ideal" investment portfolio. Your portfolio's precise mix of asset classes depends on your risk tolerance, time horizon and other factors. For instance, younger investors with longer time horizons tend to manage equity-heavy portfolios with higher levels of volatility. While they have greater upside potential, such portfolios often have greater downside risk. By contrast, retired and near-retired investors may choose conservative portfolios weighed toward bonds and other fixed-interest instruments. Our Sugar Land financial advisor experts help you choose the asset allocation strategy that best fits your needs - and adjust that strategy as your needs and goals change. *Diversification and/or asset allocation do not ensure a profit or guarantee against a loss. Settling on an asset allocation strategy is only part of the investment management equation. Investors must also determine whether to pursue an active or passive investment strategy - or alternative between the two as needs dictate. Active investors continuously monitor their portfolios in search of inefficiencies that - if acted upon quickly - could turn into profitable situations. Active investors tend to buy and sell stocks far more frequently than passive investors, who typically rebalance their portfolios at set intervals with little activity in the interim. This distinction is particularly important in the world of mutual funds. While actively managed mutual funds tend to have higher expense ratios, they may also produce better returns relative to passively managed mutual funds with similar allocations. Although there is no conclusive evidence that either strategy is superior to the other, there is a strong case to be made for combining the two approaches by allocating a portion of one's portfolio to a mix of actively and passively managed mutual funds. To learn more about our investment management services or schedule a no-obligation financial review with a Sugar Land fee based financial planner, call us at (713) 960-6949 or fill out our convenient contact form.